Steve Jobs was a notorious case-hater. He once looked at Wired’s Steven Levy with disgust when the journalist pulled out an iPod with a case on it. “I think stainless steel looks beautiful when it wears,” Jobs said. For my own reasons, I’ve never used a case on my iPhone. The glass on my $1,200 iPhone X, however, does not look beautiful when it wears. And let me tell you, it wears way too easily. Apple says that the iPhone X features “the most durable glass ever in a smartphone, front and back.” So did I get a different kind of glass by mistake? Did Apple sacrifice some quality control as it was rushing out the first iPhone X orders? Is it just my fault? Sure, I could’ve avoided some of this grief by using a case. But I’ve never used a case, and I’ve never had a screen develop scratches so quickly or so comprehensively in a decade of using iPhones and Android phones. The stainless steel edge has a couple of nicks but is otherwise good as new since I’ve never dropped the phone. The first scratch appeared on my iPhone X screen just a few days after I bought it. It was small, shallow, but clearly visible in the center of the screen. In the weeks that followed, more and more micro-abrasions appeared as if through sorcery. Then came a fan of deep scratches on the bottom left on the screen, deep enough that I could feel them with my finger and see them when the display was on. The latest scratch is even deeper and mars that cute little slice of screen next to the notch. It’s not like the phone is hard to use or anything. I just feel annoyed and confused that the thing is so fragile. I’m not the only one. There are countless threads on Reddit and other forums featuring disgruntled iPhone X owners who are similarly perplexed about how easily their screens scratch. One person claims that their iPhone X was covered in hairline scratches when it came out of the box. 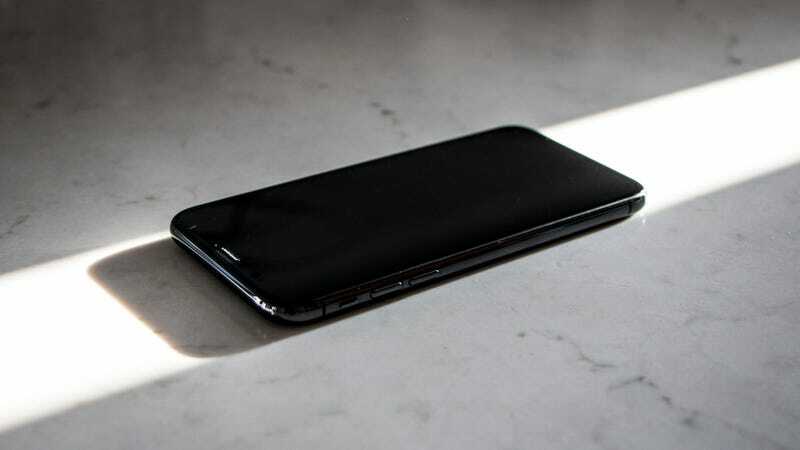 Another says that a cluster of scratches appeared “after four days of literally babying it.” Some people even say that scratches are showing up on phones that have always been kept in a case. The list of complaints goes on and on. Here’s a better shot of the fan-like series of scratches that recently appeared on my phone. I can see them when the display is on. In my case, it feels precious to let myself get worked up over what amount to cosmetic flaws on my very expensive new phone. Everyone I talk to about the screen scratches asks, “Why didn’t you put a case on it? !” Because I didn’t want to. The iPhone X design feels perfect without a case, and my experience with past iPhones had suggested that the glass would hold up to everyday use pretty well. My iPhone 7 didn’t have any significant scratches when I swapped it for an iPhone X after a year-and-a-half of use. Even still, I’m not frustrated that the iPhone X screen can be scratched. I’m frustrated that it can be scratched so easily. At this rate, I won’t even be able to see past the scratches in a year’s time. But maybe it really is just me. Maybe the screen gets scratched going into my pocket because I wear extra coarse jeans. (I don’t.) Maybe I put the phone on the table face down sometimes. (I always put it face up.) Or maybe I’m not as careful as I think I am. (None of us are.) Figuring out what’s causing the scratches won’t undo the scratches that are already there, though. I’ve reached out to Apple to find out if the company is aware of the iPhone X screen scratch issue. It does seem like a trend, though I’m clearly biased in judging its severity. I have not yet gone to the Genius Bar to see what Apple says in the store. Again, it feels like a cosmetic issue for now, one that doesn’t really affect my using the phone. Yet for the price I paid and the marketing I bought into, the iPhone X should be more flawless. It should be better than this.